Diapers, bottles, wipes and everything else your baby needs is ready. But there’s one item that is often overlooked — a humidifier. Hoping your baby will sleep through the night? Babies are much more susceptible to congestion than you are. They are also too young to take medicine to help relieve their symptoms so that they can sleep. One of the major benefits of a humidifier is protection from dry air, especially in the chilly winter months when babies often become ill. A humidifier will let your baby breathe easy and help get rid of pesky mucus build-up. Everyone knows that come winter, the dreaded cold and flu season arrives. The reason for this lies invisible in the air we breathe. Dry air is a host for bacteria and viruses, which multiply and linger for days. In humid air, these particles remain dense and sink to the floor. 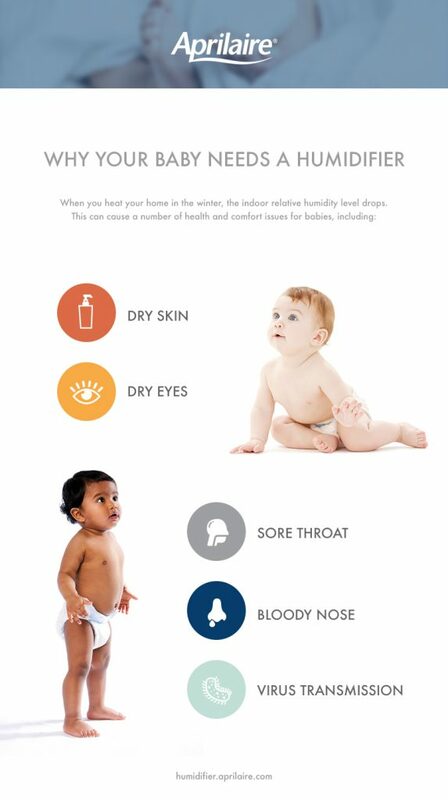 By maintaining a relative humidity level of between 45 and 50 percent, you can keep baby healthier by preventing the spread of those pesky bugs. Comfort is the key to your baby’s happiness. One great benefit of a humidifier is relief from dry, irritating skin. Your baby’s skin is sensitive to dry air and can become red and chapped without proper humidification. Even the best lotion is no match for a humidifier, which keeps baby’s skin clear and soft, just as it should be. Aprilaire helps keep your family healthy and comfortable with whole-home humidifiers that automatically maintain proper moisture levels throughout your house. And that’s the truth, baby. I didn’t realize that a humidifier kept bugs and viruses by the floor instead of floating where we could breathe them in. This would be really important if you had little babies who were still weak in their immune systems. Keeping them healthy would be the most important thing to do! Hey I really love the infographic! Is there a way to use it on my own site? Thanks for your time!